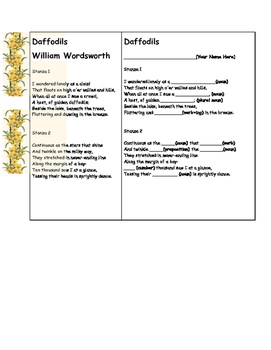 Have your students read the first two stanzas of Wordsworth's poem "Daffodils' and complete this graphic organizer. Many state standards are addressed including reflecting on author's purpose. Next have them (MAD-LIB style) revise the poem by changing nouns, adjectives, verbs and prepositions. 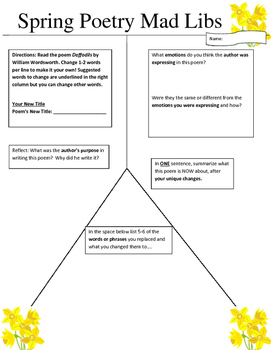 They will also summarize the meaning of their poem in the graphic organizer. These are FUN to share whole class to ring in or end a unit on poetry! Reading and Writing grades can be given. Pair students up to scaffold the activity for ELL/SPED students.